"Pro football is a game...not a war. It's for win or lose, not life or death. But say that in the summer, for winter brings the playoffs, and a season is at stake." The value of good publicity is priceless; just ask the National Football League, an organization that took a flyer on businessman Ed Sabol, granting him the rights to make a film of the 1962 NFL championship game for $3000. Sabol's film, subtitled The NFL's Longest Day, proved enough of a hit with the league that they bought Sabol's company and re-named it NFL Films. Since then, NFL Films has become an vital part of the NFL, becoming what I would imagine is the most successful industrial film house of them all. Viewers of a certain age will recall the various films the league made, especially John Facenda's narration and Sam Spence's enjoyable if occasionally derivative music. In the new box set NFL Films: Legends of Autumn, we get three discs' worth of films celebrating the NFL Films experience. A few years ago, record label Tommy Boy made many fans' dreams come true with a compact disc collecting the most memorable music and narrative bits from various films in the NFL Films catalog; the title of that compilation was The Power and the Glory, and that sums up, as well as anything else, the approach of the NFL Films crew in making their films. Football is glamorized as a sport of speed, power, and violence, bringing glory to its winners and crushing heartbreak to the losers. Hyperbole and melodrama always seemed to be the order of the day (I still recall Facenda describing the result of the standard battle between cornerback and wide receiver: "the loser bleeds alone on an empty field"). Ridiculous to be sure, as we're watching football highlights, not footage of World War I trench warfare, but one of the chief traits of NFL Films during its classic period was making even the lamest game seem like an immense Clash of Epic Implications. The power of manipulative filmmaking, indeed. Disc 1 gathers some foundational films in the NFL Films story; the first is that $3000 gamble, The 1962 NFL Championship Game: The NFL's Longest Day, which covers the eponymous game between the New York Giants and Green Bay Packers, a game won by the Packers 16-7 in brutally cold subzero conditions. The film, narrated by longtime sports announcer Chris Schenkel, is pretty dull compared to the more sophisticated work we're used to, but it uses then novel techniques like slow motion and replays, in addition to solid editing, to make up for an overall lack of narrative thrust and music. This is mainly interesting as historical artifact and time capsule, but it pales in comparison with the later films. Next up is They Call It Pro Football, which Sabol happily tells us has been called "the Citizen Kane of football movies." It was the first film to present the Facenda/Spence combo, and the film retains a dynamism that makes it fun to watch, despite the "footbal primer" subject matter. We can see how the production values and style have improved exponentially from the previous film. All the hallmarks of the classic NFL Films style are here: the slow motion, the tight focus on a given player at the expense of the larger action of the play, and the music and narration. Superbly edited, great footage, and very well done. Coaches get the spotlight in The Man Behind the Men, focusing mainly on Allie Sherman of the Giants, Sid Gilman of the Chargers, and Hank Stram of the Chiefs. We don't learn much about them personally; the focus is on their onfield demeanor, which often means insulting and threatening their players, whether it be overt or vague in manner. Sideline activity gets a big focus as well, as quick editing cuts through the entire game experience, looking at the highs and lows of the job. Watching it didn't make me understand their job any better than I did before, nor understand them that much more personally. It's well made to be sure, though. Disc 2 begins with 1980's Legends of the Fall, which aimed to look at the best who had played the game at quarterback, running back, and team. It's obviously way dated at this point, but you'll still get to see some all-time greats like Jim Brown, Gale Sayers, Johnny Unitas, Otto Graham, and several more. It remains worthwhile fodder for debate among football fans, who can now add in nearly three decades' worth more players to the arguments. In The New Breed, we get a quaint look at players who were breaking the stereotype of the crew-cut wearing, straight-arrow player of yore, focusing on Chargers running back Dickie Post and Eagles linebacker Tim Rossovich, both "free spirits" who were living it large, Post as an owner of a California boutique and Rossovich a self-proclaimed hippie who lived on the beach. Considering today's brand of free spirit, these guys are vanilla all the way. You will also get to view some truly grotesque fashions when watching this as well. Disc 3 begins with Three Cheers for the Redskins, providing a behind the scenes look at the 1971 Washington Redskins, in their first year under new coach George Allen. The focus is more on Allen than anything else, as the coach brings in his preferred veteran players and tries to re-build a floundering franchise. He succeeds wildly at first, before injuries and other teams catch up. Allen proved to be a natural for the NFL Films team, an ebullient, optimistic guy who oozed love for football and his players. The cameras don't show us anything cynical or nasty, and the rah-rah attitude he inspires comes off as utterly alien in this age of media whores like Terrell Owens and the like. The film deals in generalities rather than fact; I found myself wanting scores and stats on occasion, something the film rarely doles out, preferring to couch its analysis in impressionistic language and images. The other film here is Championship Chase, which looks at the 1974 season from beginning to end, covering the race for the playoffs and that precious Super Bowl berth. It also includes the cheesily melodramatic "The autumn wind is a Raider" bit, set to an arrangement of "What Do We Do With the Drunken Sailor?" that anyone who saw it will probably remember. It's an entertaining re-cap of the season, which saw the Steelers win their first title, over the Vikings. I'm not sure if anyone has done research into this, but I would suspect that NFL Films played a large role in the ascendence of football as America's favorite sport. Football has violence going for it, which Americans love, but it's often tremendously dull to watch. Most of a viewer's time is spent waiting for something to happen, boredom punctuated with bursts of action. NFL Films gave football drama and mythology to go with the inherent violence, and America's new pastime took flight. This box set allows you to get an idea of how that happened. Image Transfer Review: The films are presented in their original full screen ratio, and do not appear to have had much if any restoration work done, as the older ones are rife with speckling and other forms of wear, although color-wise they look rather good. Audio Transfer Review: The original audio is on hand for each film, and while not as rough as the video side, still doesn't sound especially great. It's functional and not much more. Extras Review: Each disc contains episodes of the series Lost Treasures, a show marketed as digging into the vaults of NFL Films. These are quite entertaining, and I'm amazed they were thrown in here as bonuses, given each one runs almost 50 minutes. The set contains five shows, which include the following: The Beginning (42m:34s), The Lost Sounds (43m:46s), The Players: 1966-68 (43m:42s), Sundays With Soul (47m:46s), and The NFL Style (46m:47s). If you're a fan, you will certainly want to watch these, as they include footage previously unused for various reasons, and the shows themselves are interesting, looking at the early days of NFL Films, the house filmmaking style, sound work, and more. Also included is an American Film Institute tribute to NFL Films (21m:29s), in which Sabol and author David Maraniss discuss the work done by Sabol and company. Not essential, but worth a look. Finally, Sabol contributes three worthwhile commentary tracks on They Call It Pro Football, The New Breed, and Championship Chase. Football fans in America above a certain age will lap up the goods presented in this three-disc set, collecting some of NFL Films' foundational works. There is a fair amount of wear and tear on the older material, but that sort of adds to the charm. 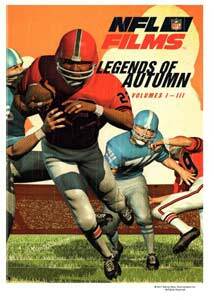 Thrown in as generous bonuses are episodes of the Lost Treasures series that NFL Films produced. The retro-styled packaging aims this squarely at the over-30 crowd, the main audience for this set.